When Ellen DeGeneres started seeing someone new a few years back, all I knew about this person, Portia de Rossi, is that she was the fierce icy blond on Ally McBeal. I used to watch Ally McBeal with my Mom back in the day, as silly as the show was. I later found out she also had a character on Arrested Development. I’ve since read articles in various magazines about how happy she is to be married to Ellen. In these brief glimpses of Portia de Rossi, I never would have guessed that she had a severe struggle with coming out as a lesbian and an even worse struggle with anorexia and bulimia which almost killed her. 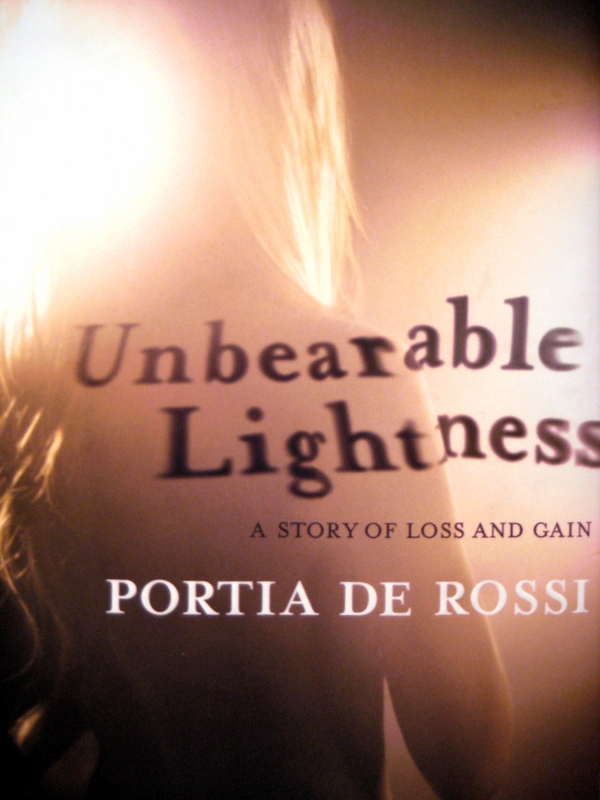 Unbearable Lightness talks about de Rossi’s dark past, being an early 20 something newly in Hollywood from Australia and her downward spiral into anorexia. Portia de Rossi really surprised me as a writer. She is very poetic in her descriptions and the story she is weaving becomes completely engrossing. We can actually watch the subject, de Rossi, become consumed by her illness to the point in which all she thinks and obsesses about is food and her weight. She feels an intense pressure to be perfect, having just scored a major role on a hit TV show, Ally McBeal. She actually does not talk too much about the show though except how much she hated it and how the actors or actresses on the show barely spoke to one another outside of shooting a scene.